With Spring a mere 7 days away, I’m more in the mood for colorful blooms then cozy knits. My paper flower love affair all started with this pin of some fantastic Coffee Filter Flowers via the always inspirational Design Sponge and led me down the rabbit hole of paper flower pinning all of which you can see on my aptly named Stuff to DIY board. 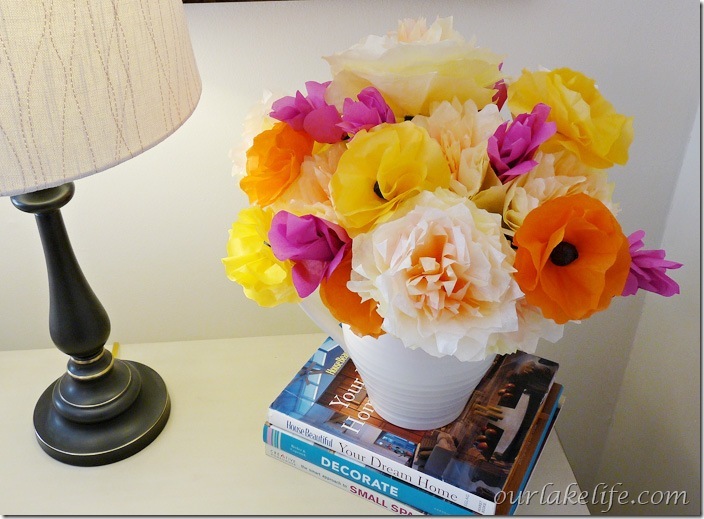 So I started with the coffee filter flowers but I did a few things a little differently. I felt like I wanted to do something different than using paint to to dye the coffee filters, I thought about it for a moment and decided food coloring would probably work wonderfully instead of paint. It totally worked, I think my dyed version turn out pretty darn well. There’s 3 different types of paper flowers in my bouquet, Paper Peonies original tutorial here, Rolled Rosebuds original tutorial here and Poppies my own take on some of the general tutorials I found. I’ll detail each one below so you can see what I did similarly to the original tutorials and what I found worked for me that’s different. Shall we get crafting our own paper flowers? 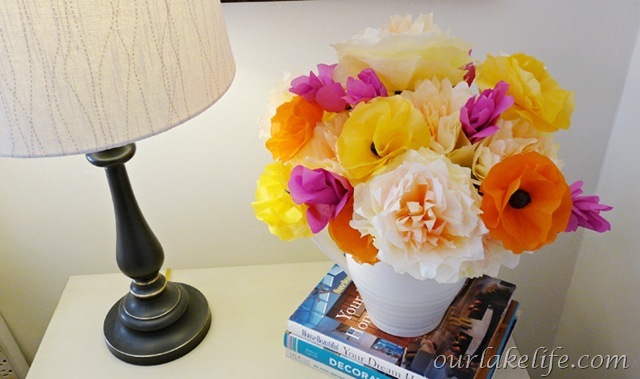 The paper peonies are gorgeous on their own and probably the most time consuming of the three that I tried. If you get an assembly line going they’ll go quicker. The results are stunning and worth the time. To start dying your coffee filters you’ll need a whole boatload of coffee filters, 60 to be exact, 3 bowls and food coloring in yellow and orange. I used the concentrated gel kind which I found in the cake decorating section of Michaels craft store. In each of the three bowls place 1 cup of warm water. In the first bowl add equal parts yellow and red food coloring until you get a nice deep orange color. In the second bowl of water add 2 parts yellow to 1 part red food coloring. In the third bowl add only yellow food coloring. Following the original instructions via Design Sponge I placed 10 coffee filters in the darkest color, 20 in the mid-range color and 30 in the yellow. Let them set for a few minutes, the longer they sit in the dye bath the more vibrant each of the colors will be. Once I was satisfied with the color I removed the coffee filters and wrung out the excess water. Then I separated each filter and left them out to dry. Just FYI they’re pretty slopping and ugly looking when wet. 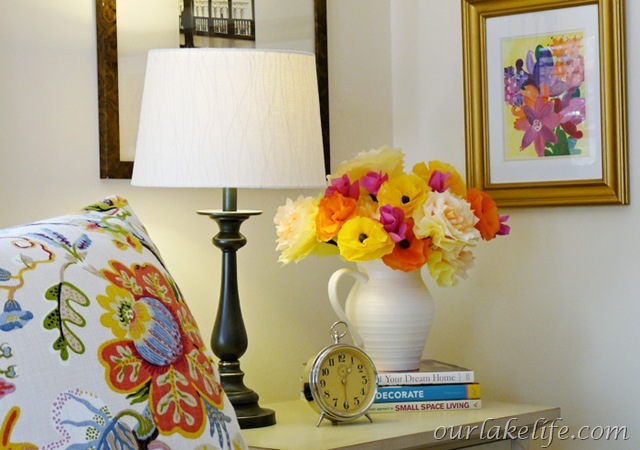 Tip: to speed drying you could use a hair dryer set on low or hang them in front of a fan. Once they were all dry I sorted the stacks by color then separated 10 to a stack. 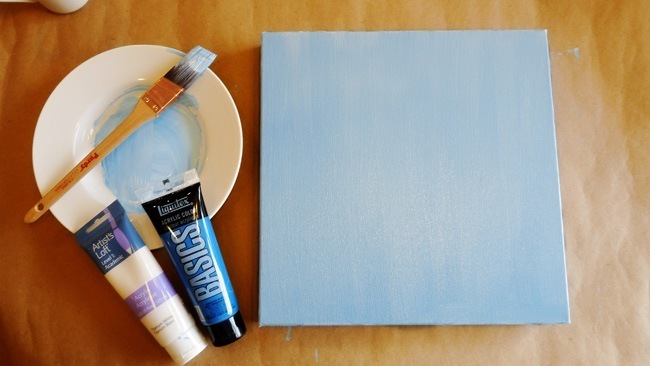 You should have 1 stack of the deepest color, 2 stacks of the medium color and 3 stacks of the lightest color. Next fold them in half and then in quarters, into a pie shape. Cut the rounded edges, more jagged cuts into the deepest color graduating to shallow almost rounded cuts into the lightest color coffee filters. Finally make a small snip in the pointed end so that there will be a small whole the center of your filter. Here’s where my version differed a little again, I used wooden flower picks instead of straw for the stems of my flowers. I liked how the picks had floral wire at the top of each pick which made attaching the petals to the stem easier than using the masking tape and straws method suggest in the tutorial. I selected 1 of the darkest dyed coffee filters folded it up in the middle twisted the based and attached it directly to the wood pick, winding the wire tightly to secure it to the wood pick. Then I placed 1 of the medium dyed filters, sliding it onto the pick through the hole I cut in the center, then crimp around the wooden stick and attach with floral wire. Then I repeated for 1 more medium dyed filter and 3 of the lightest dyed filters. In total I had 1 dark filter, 2 medium filters, and 3 of the lightest filters wired to your wooden pick. Then I wrapped the whole stick in green floral tape to cover the wires and entire wooden stick. 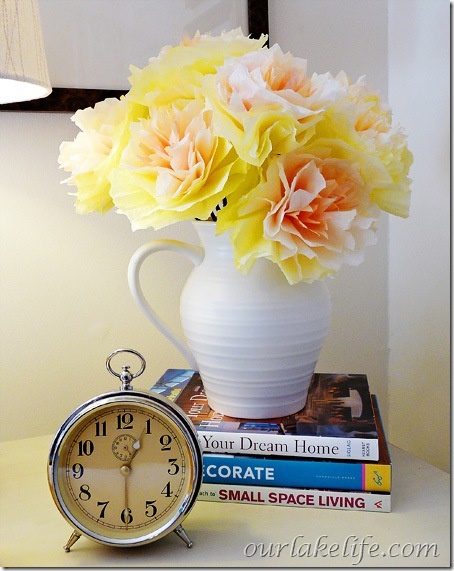 Repeat for each paper peony, when I was done I had 10 full flowers. 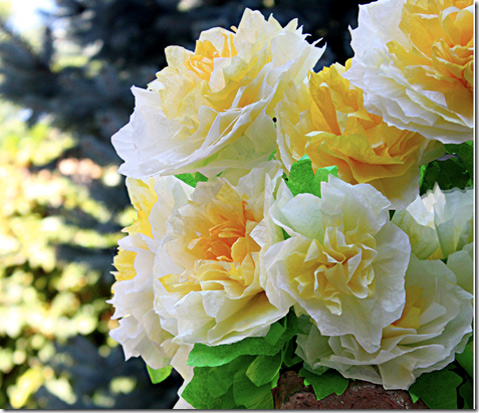 The paper peonies were gorgeous, I almost want to kiss the original person who though of this because they’re that pretty and addicting to make. Once the peonies were complete I decided some pops color in the bouquet would be a nice touch. The hot pink flowers are cut and rolled to make small rosebud flowers. They were so simple and far less time consuming than the peonies. I think the combination is stunning. The rolled rosebuds are infinitely more simple when compared to the paper peonies, but none the less gorgeous. Attach to a floral wood pick with wire, wrap the entire base of the rose bud and stem with green floral tape to secure and finish. The poppies are a hybrid version of the paper peonies it’s similar principle but different materials and much different results. I think they play nicely in combination with the other flowers. 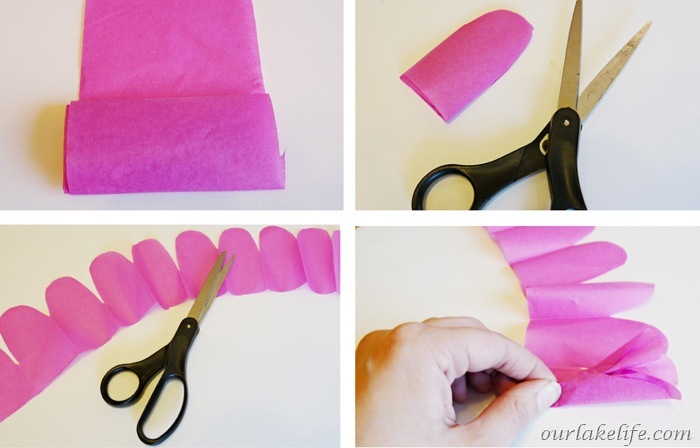 For the petals, start by tracing and cutting out 3 circles onto your sheet of tissue paper. Stack the circles together and fold into quarters creating a pie shape. Cut the rounded end of the pie shape so that the ends are wavy. Snip just the tip of the point to create a hole in the center of your tissue paper circle. Cut a small square out of your black piece of tissue paper. 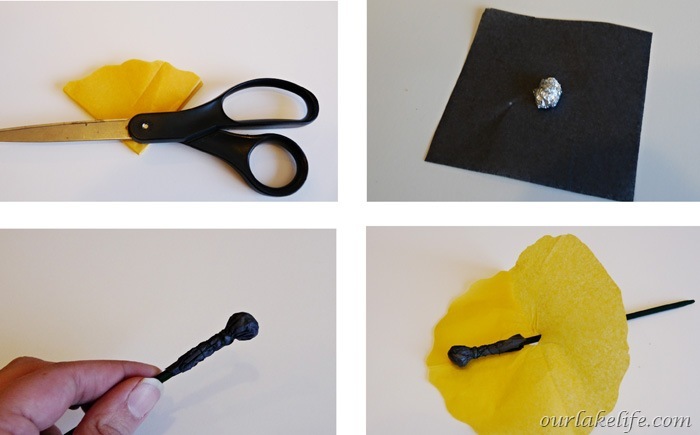 Place a small ball of tin foil in the center, wrap around the top of your floral pick and secure with wire. Place 1 piece of your now cut petal rounds onto the wood floral pick through the center hole you snipped in the first step. 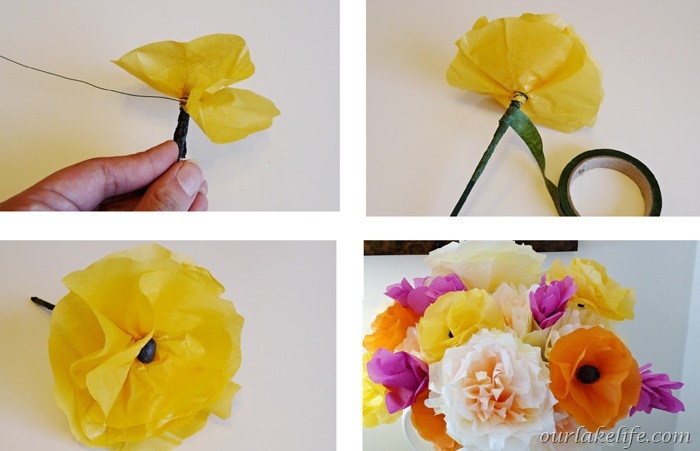 Crimp your tissue paper petal onto the floral pick securing with green floral wire, repeat for 2 more petals. 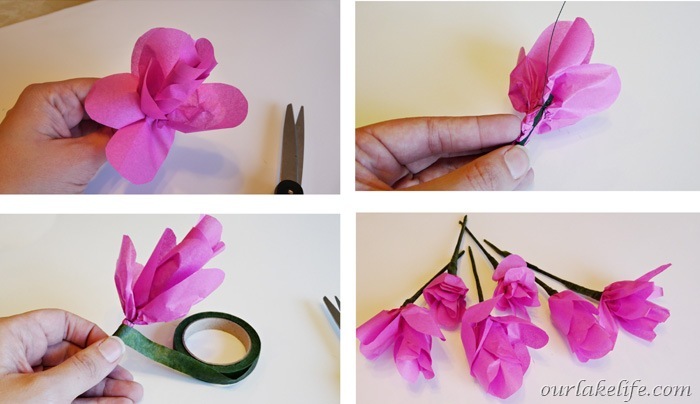 Wrap the entire wood stick including the wired base of the petals in green floral tape to secure tightly. I have to say these turned out soooo much better than I expected. I’ve had to explain to everyone who has walked in the house that they were made from scratch by me and not flowers stems I bought and put in the vase. I’m a little stupid giddy over them and I’m tempted to pet them lovingly each time I walk into the room. 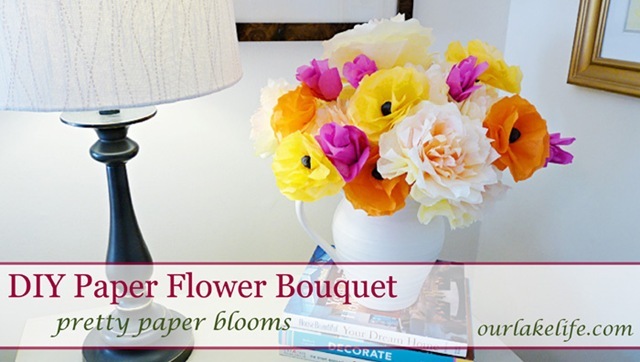 There’s so many possibilities for these paper flowers, like create a few and set them into everyone’s glass for a dinner party or create a fun center piece, decorate for a party and even make them into napkin holders with a little modification. The possibilities are endless. 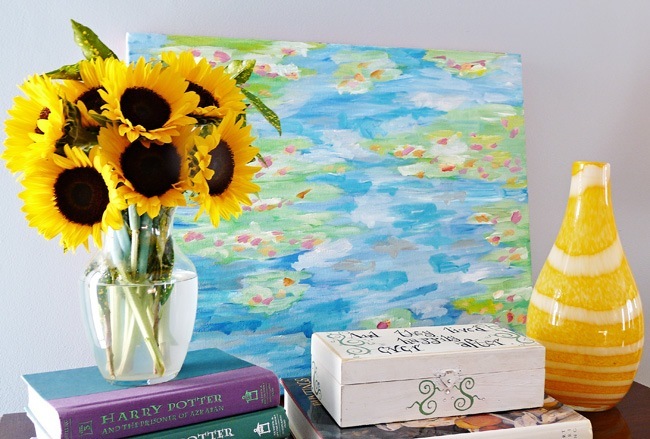 There’s only one thing I love more then a good art project…and that is an easy, fun, and personalized art project. Lately I’ve been admiring Picasso’s line drawings and silhouettes. There’s something about the brilliant simplicity of Picasso’s drawings that got me thinking (by the way the Camel and Penguin are my favorites). I remember doing silhouettes as a kid in school, we’d stood in front of a bright light and our Art Teacher traced out our shadow onto a piece of black construction paper and we’d cut it out. It was definitely one of the more fun projects I remember doing in class. 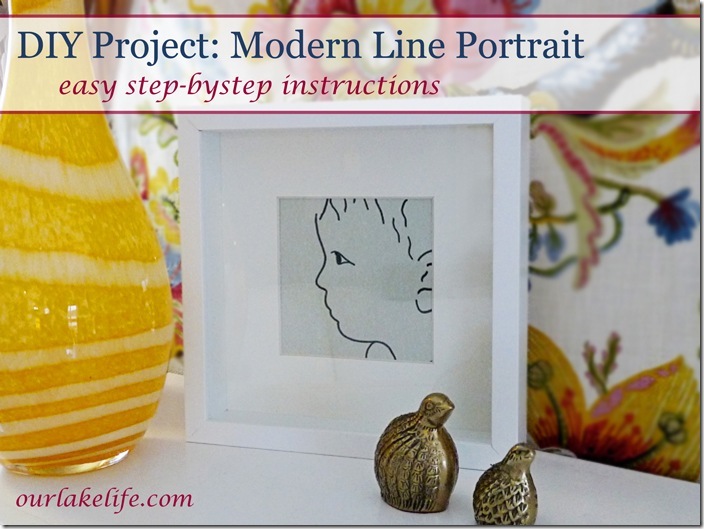 So of course I thought it be fun to take mix some of both those concepts for this easy DIY Modern Line Portraits. 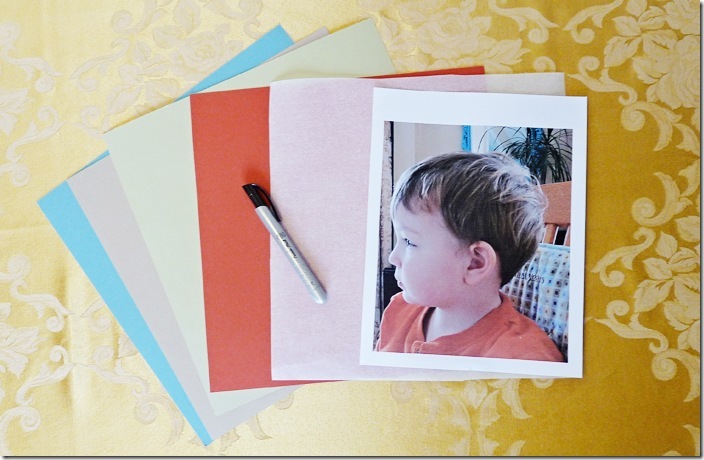 It was such an easy project I’m tempted to keep trying this with so all kind of photos. 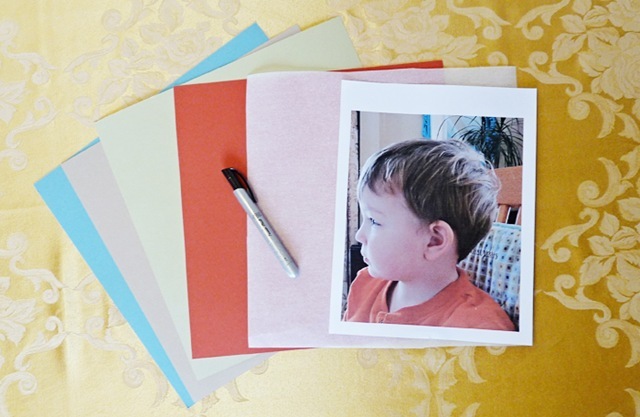 Print out your chosen profile picture onto plain white paper. You won’t be keeping this image so don’t worry about what kind of paper you print it on. Lay your tracing paper on top of the printed picture and begin tracing over the top of it. Starting with the outline first and working your way onto only select details like a few strands of hair, eyes, ears, etc. 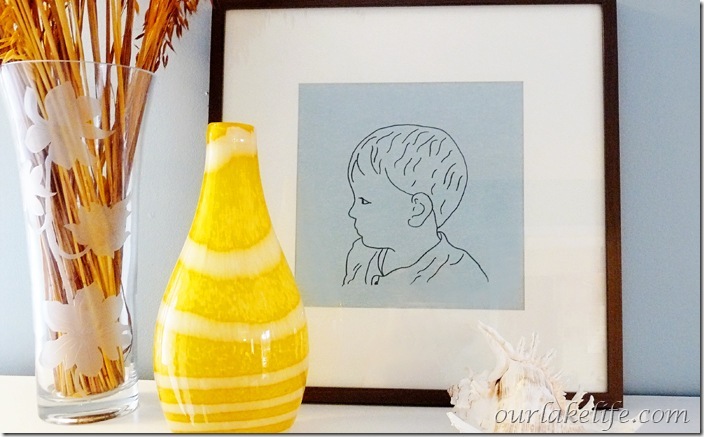 Once your satisfied with your line drawing lay your tracing paper on top of a vibrant colored sheet of scrap book paper. The tracing paper will mute the color of the scrapbook paper and create a subtle background for your personalized modern line portrait. Like I did you can choose to do a full bust portrait. Or a smaller version focusing on the face and eyes only. 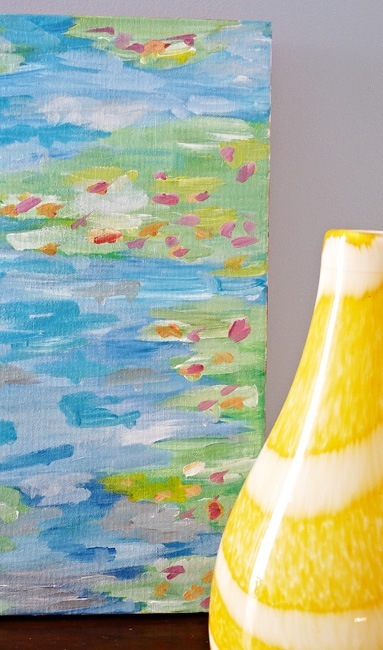 Hello, and welcome to our little house by the lake…so happy you’ve stopped by! If you’re new here you might want to come visit our Lake Tours page, grab a cup of coffee, take a look around and enjoy this beautiful lake we get to call home. Or you can subscribe to our RSS feed for OurLakeLife updates. Welcome to Our Lake House! 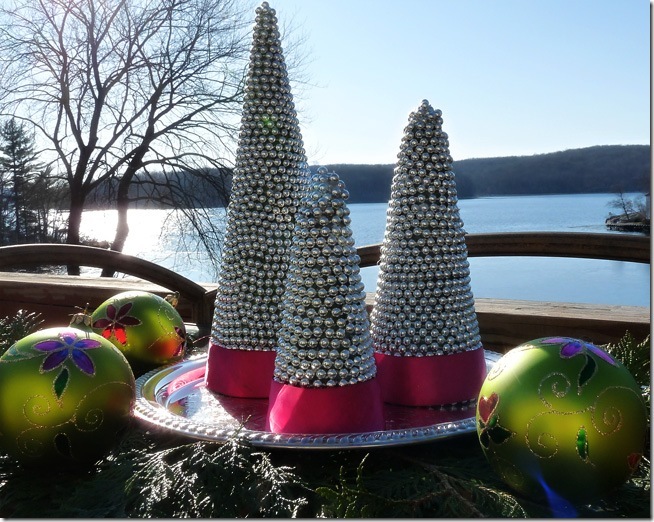 It’s been a jam packed weekend around here, full of baking and crafts, and here’s a project I whipped up over the weekend, a beaded Christmas tree created with cone forms and beaded garland. 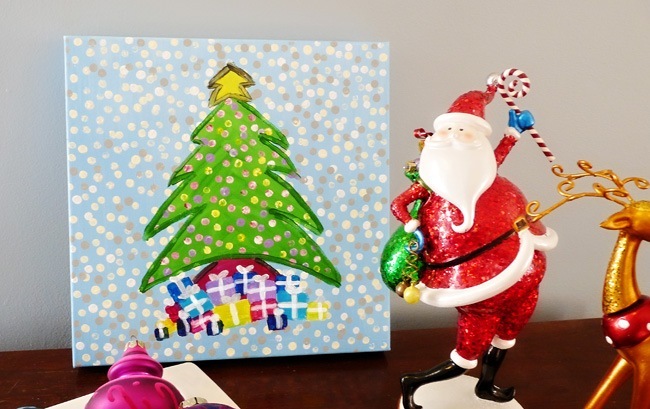 It’s so sparkly and festive, and is the perfect last minute craftiness right before the holiday. These are so simple to create, you can make them in all different sizes and colors. 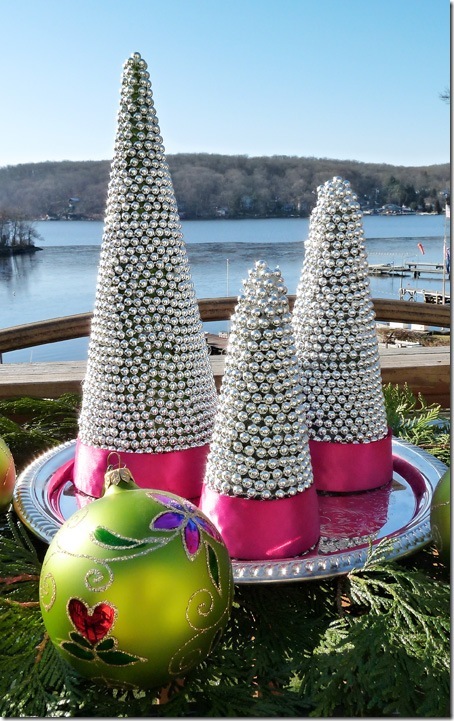 You could even have a very blingy Christmas forest on your mantle, or make little ones at each place setting. Cone forms (I used both the cardboard kind and foam kind), beaded garland ( I used 5, 18 foot strands for the 3 trees), hot glue gun, ribbon, green craft paint. 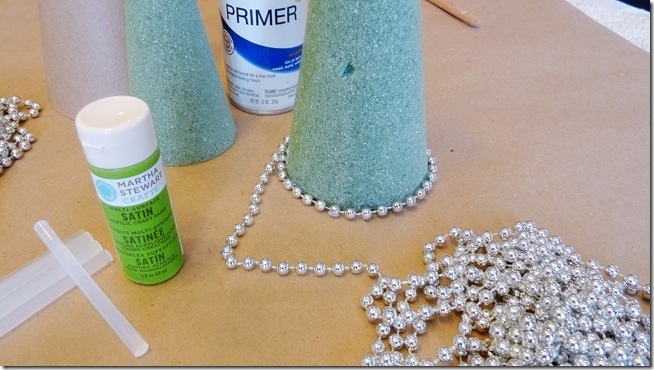 If you’re using a cardboard form paint the cardboard with green craft paint so that any gaps in between the beads would look like the tree peaking through the decorations. If you’re using a green foam form you can skip this step. 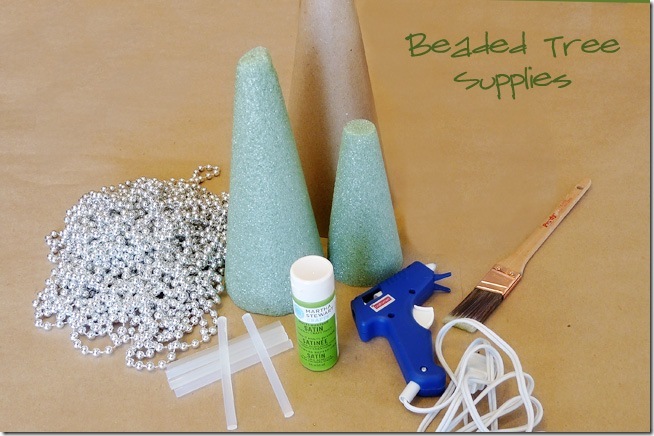 Starting from the bottom up begin hot gluing the beads to the foam cone. Continue wrapping the beads around the cone pushing each bead so that it settles into the space in between the beads in the row below. 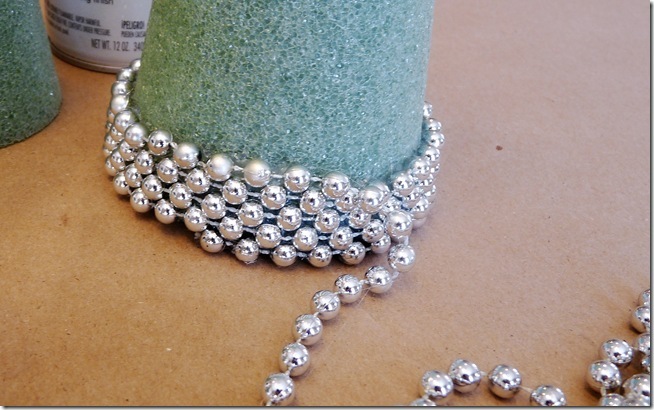 Wrap a ribbon around the base of your beaded tree, securing in the back with a dab of hot glue. 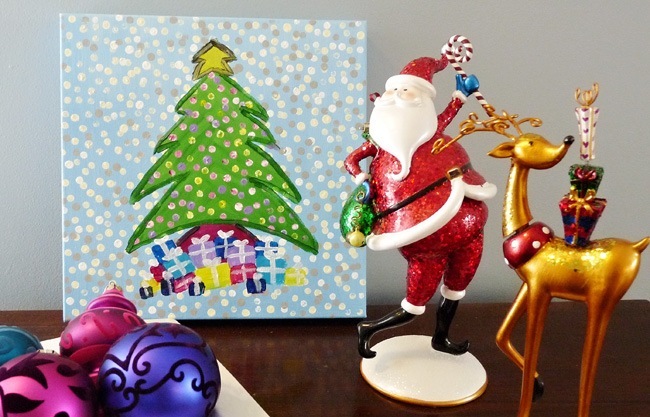 Stand back and marvel at your sparkly new Christmas Craft. After working with both the cardboard and foam cones, I preferred the cardboard forms, they were easier to glue onto and I liked that they were pointier at the top, where the foam ones were cut off at the top. These did take some time to complete, each tree took around 30 minutes of hot glue time, but it’s a easy project you could do in front of the TV. 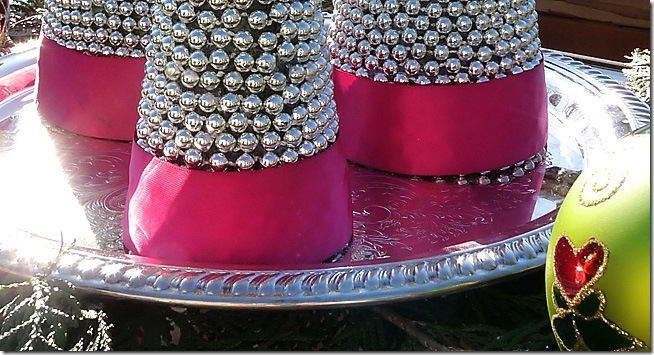 They look so cute on a silver tray with some natural greens and a few ornaments strewn about. 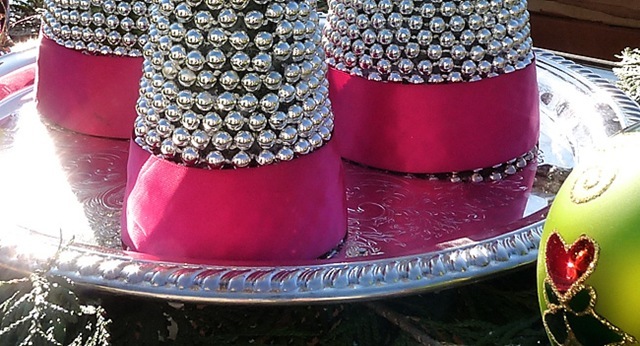 They’d make a great sparkly addition to any Christmas table or mantle. 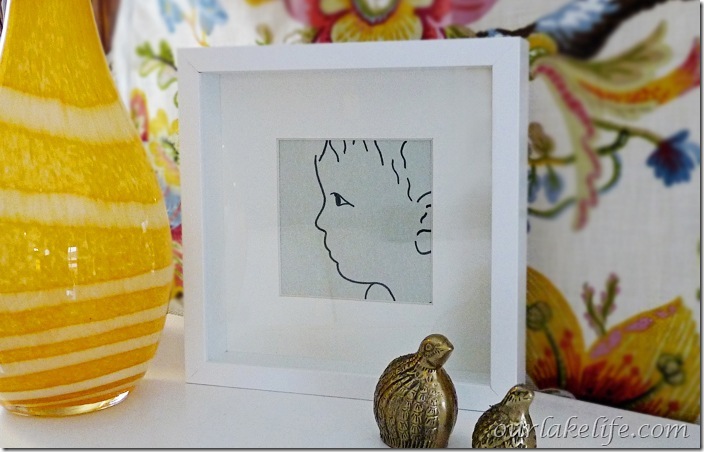 Linking up at Hi Sugarplum! I hope everyone had a great Thanksgiving weekend. We did. We got a lot done on our fireplace mantel project and it looks so great. I’ll promise to share all the details soon. I’m so happy that it will be ready just in time to hang our stockings by the chimney with care. Now that Thanksgiving 2011 has officially come to a close we can officially begin Christmas decorating of course. And nothing says handmade projects to me more than Christmas time. Growing up we always had special holiday art that my Mom had made, hers was a wonderful embroidered Santa Claus I always admired. Each year at Christmastime it was part of the holiday preparations that magically transformed our house into the familiar Christmas home we’d grown up loving. I’m definitely no stranger to fun Christmas projects to bring in that Holiday cheer. 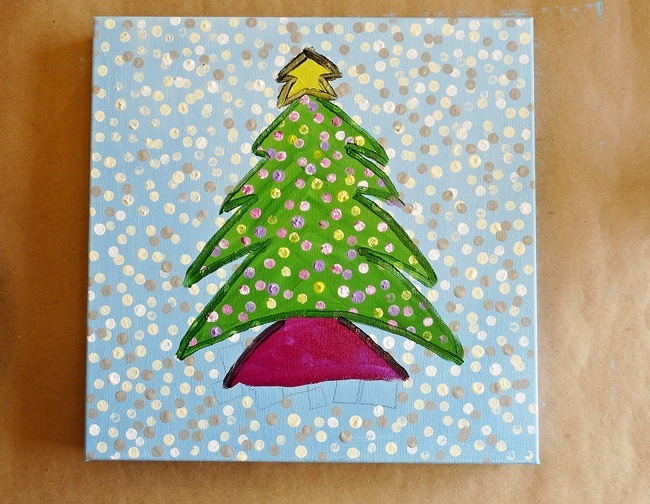 I love to paint and this little whimsical tree was a fun afternoon project. 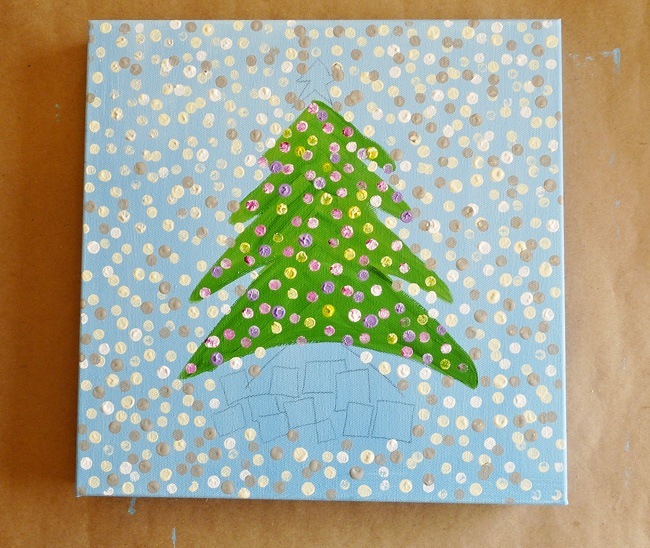 To paint this Whimsical Tree I used a 12 x 12 inch canvas I had in my art closet and painted the entire canvas, background and sides a light blue color. Next I transferred my Christmas Tree Sketch I drew (downloadable here) using carbon transfer paper. Once the background is dry to the touch I painted the body of the tree a light Christmas Green. 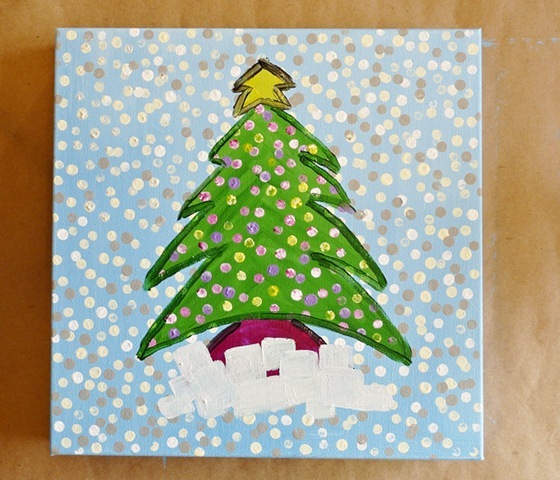 I painted the snow by using the eraser end of a pencil in cream, white and gray dipping the eraser in the paint and dotted in a random pattern. The Christmas lights are painted the same way using an eraser in dipped and dotted in purple, pink and yellow paint. 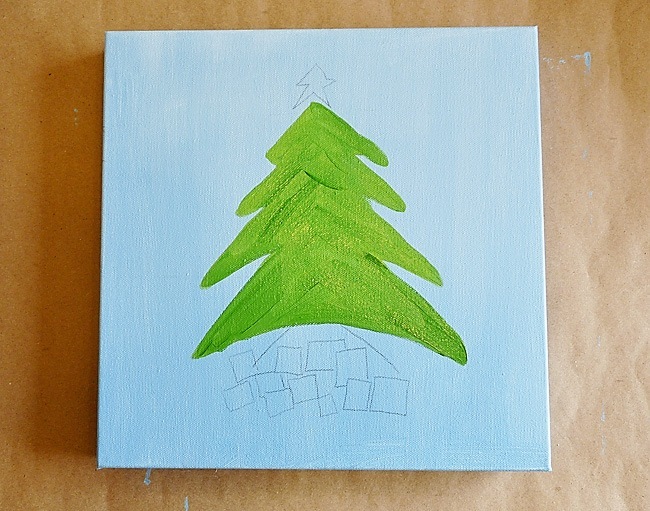 Next, I painted the hot pink tree skirt and outline the tree in dark green and the tree skirt and star in black. Finally paint the package squares first in white which acts like primer over the darker background paint allowing the present colors to shine. 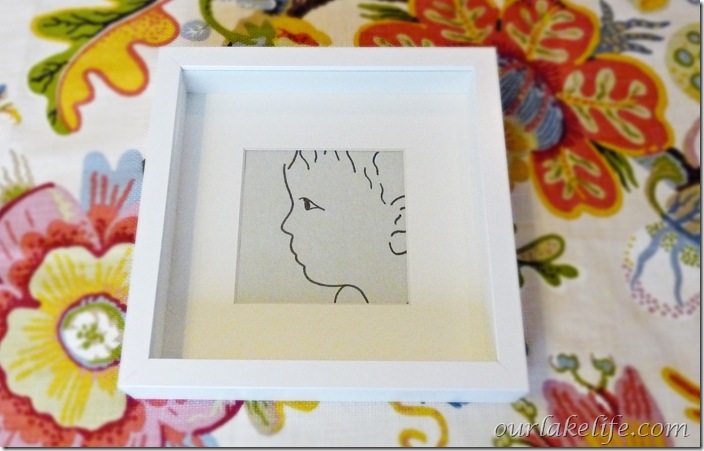 If you’re looking for a fun project to do with the kids this would be a fun and simple project. 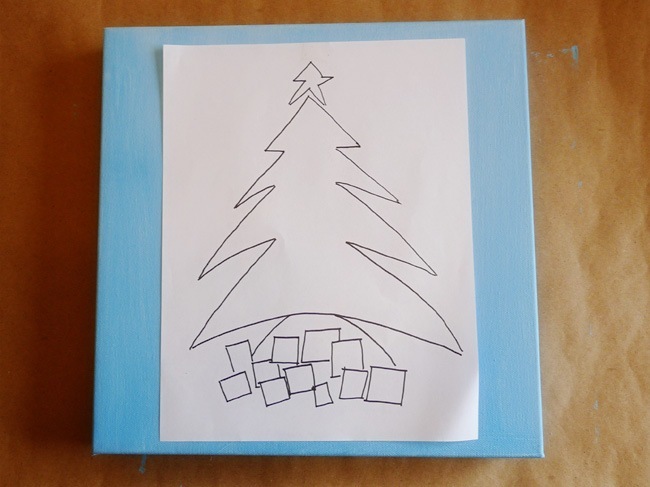 Just sketch yourself a tree or use my sketch and add some painted snow dots, Christmas lights and presents. It also looks pretty darn cute propped on a table with few of your favorite Christmas things. Just stopping in quickly to share my latest painting. I love the turquoise, green and pink palette. To me it feels at once calming and cheerful.